Israel's Supreme Court on Thursday ruled in favor of demolishing al-Khan al-Ahmar village and relocating its 35 Bedouin families to al-Eizariya town east of Jerusalem. Head of the community Eid Jahalin said that al-Khan al-Ahmar residents completely reject the court's decision. Jahalin affirmed that the only alternative they would accept to al-Khan al-Ahmar, which they have been living in since 1953, is Tel Arad village in the Negev from which they were expelled by the Israeli authorities. According to Jahalin, a court hearing was held on 25th April on the petition filed by al-Khan al-Ahmar residents against the deportation decision. The court then decided to give them a 10-day time limit to find a place to move to instead of al-Eizariya. Jahalin slammed the Palestinian negotiating delegation who signed the Oslo Accords which said that Area C was not populated. 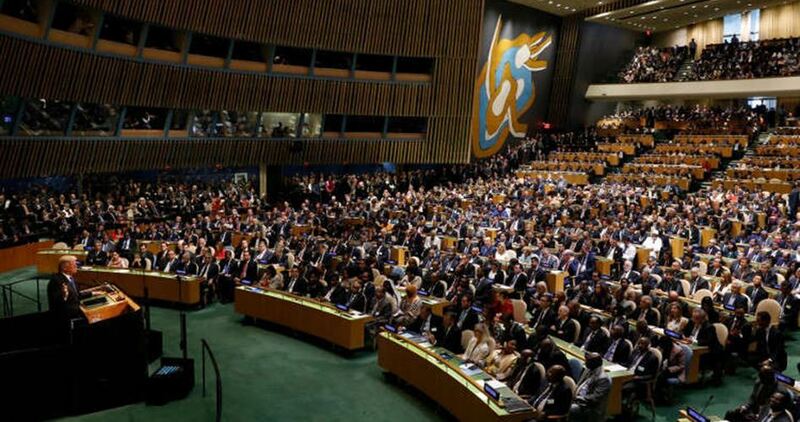 He continued to say, "Our expulsion from al-Khan al-Ahmar is part of Wadi Araba Treaty which was signed between Jordan and Israel and provides from establishing a peace route that connects Tel Aviv with Jordan at the expense of the families living in al-Khan al-Ahmar." He pointed out that the demolition and deportation decision is expected to be implemented at any moment. There are 23 Bedouin communities in East Jerusalem and they are inhabited by 5,000 Palestinians. Jahalin noted that the demolition of al-Khan al-Ahmar will be the first of a series of demolition and deportation campaigns targeting the rest of the Bedouin communities in favor of the settlement project E1 which is aimed at separating the northern part of the West Bank from the southern one. Al-Khan al-Ahmar is inhabited by 35 families and has a school with 170 students and 16 employees. Jahalin said that al-Khan al-Ahmar residents have been repeatedly subjected to fierce attacks and demolition operations by the Israeli occupation forces since 1953. 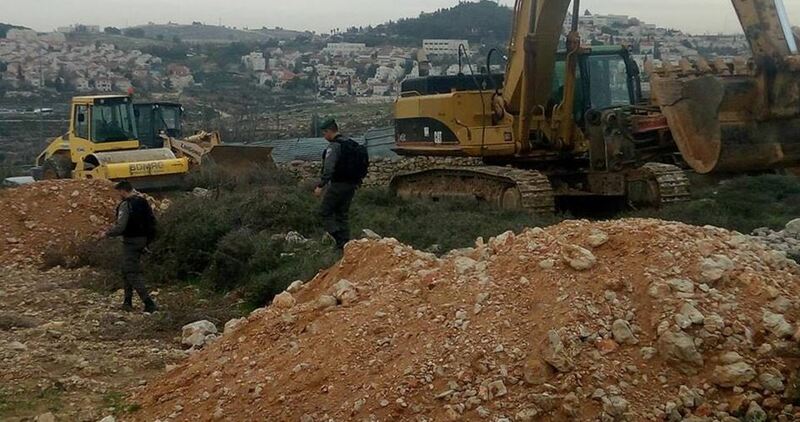 The Israeli occupation authorities (IOA) have notified the demolition of a number of Palestinian houses in Deir Ballut town west of Salfit in the central West Bank. Activist Daoud Abdullah said that the Israeli army had informed Deir Ballut Municipality that it would demolish the uninhabited houses located in Area C.
In a related context, Jerusalem Legal Center has warned that the IOA will step up restrictions on the Palestinian construction activity in Area C.
According to Deir Ballut Municipality, the targeted houses are located east of the town near Leshem settlement which is built by force on privately-owned Palestinian lands and is being expanded at the expense of Deir Ballut lands. Anti-settlement researcher Khaled Ma'ali said that villages and towns west of Salfit are constantly targeted with settlement expansion projects, explaining that the Israeli authorities are planning to create a settlement bloc extending from Za'tara checkpoint to the 1948 occupied Palestinian territories. Ma'ali pointed out that the targeted houses of Deir Ballut have been repeatedly notified with demolition, adding that the IOA may demolish them all at once, which violates international humanitarian law. Seventy-six Members of the US Congress have co-signed a letter to the Israeli Prime Minister Benjamin Netanyahu urging him to end the demolitions and evictions of Palestinians in the occupied West Bank. “This is the latest sign that US lawmakers are increasingly concerned by the alarming consequences of the Israeli government’s policies in the West Bank,” said Dylan Williams, J Street’s Vice President of Government Affairs. The letter also “cites over 300 rabbis, organized by J Street and other American Jewish groups, who wrote to Netanyahu in January opposing demolitions”. Israeli naval forces on Thursday morning arrested five Palestinian fishermen sailing off Gaza’s northern shores. Activist Zakaria Bakr said the Israeli occupation navy arrested the two brothers Rasem and Mohamed Zayed as they were setting sail off Gaza’s northern coast. The occupation navy fired gunshots toward the brothers’ vessel before they dragged them to an unknown location. Israeli naval ships attack Palestinian fishing boats on a quasi-daily basis while they are sailing within the allowed six-nautical miles from the shore. 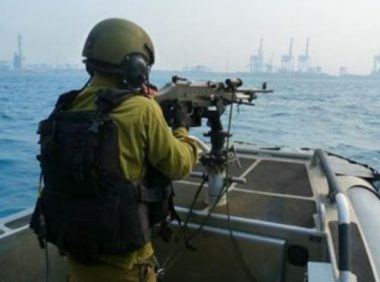 Israeli navy ships attacked, on Thursday morning, several Palestinian fishing boats, and opened fire at them in the Sudaniyya Sea, northwest of Gaza city, before abducting two sibling fishermen. The WAFA Palestinian News Agency said the soldiers used automatic fire against several Palestinian fishing boats, in Gaza territorial waters close to the shore, causing damage. WAFA added that the soldiers also abducted two fishermen, identified as Rassem Ishaq Zayed, and his brother Mohammad, and confiscated a fishing boat. The attacks are part of daily violations against the Palestinians in the besieged and impoverished Gaza Strip. Such attacks have led to dozens of abductions, and hundreds of casualties, including many fatalities, in addition to causing serious property damage. The Israeli Occupation Authorities (IOA) notified a Palestinian from the village of al-Khader, south of Bethlehem, to leave his land near the village, local sources said. Hassan Burajiya, a local activist, told WAFA news agency that Israeli forces ordered Mohamed Issa Mussa from al-Khader to leave his land, claiming that the land is state property and that no Palestinian should enter it. Mussa was given 30 days to appeal against the confiscation order. Burajiya said that Israeli authorities have recently escalated attacks against al-Khader town. 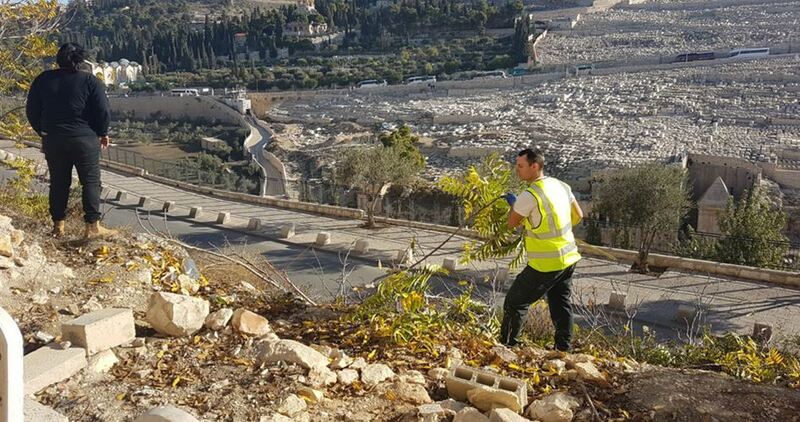 Israeli forces on Monday demolished parts of the outer wall of Bab al-Rahma cemetery in occupied Jerusalem. Officers of Israel's Nature And Parks Authority (INPA) escorted by Israeli forces stormed the cemetery and placed iron fences around the tombs as a prelude to confiscate the sieged area. The Bab al-Rahma cemetery is a historical cemetery located outside the eastern wall of al-Aqsa Mosque, which houses the graves of two of the companions (Sahabah) of the Prophet (peace and blessings of Allah be upon him), Ubadah-bin-Samit and Shaddad-bin-Aus (may Allah be pleased with them). The cemetery has been subject to multiple attacks after Israeli authorities announced plans to seize parts of the cemetery for a national park trail in 2015. The Israeli occupation forces (IOF) over the past few days have arrested five Palestinians during raids into different West Bank provinces. The Israeli army in a statement Monday announced that its forces since the beginning of the week have arrested five Palestinians who are allegedly involved in popular resistance activities against Israeli targets. 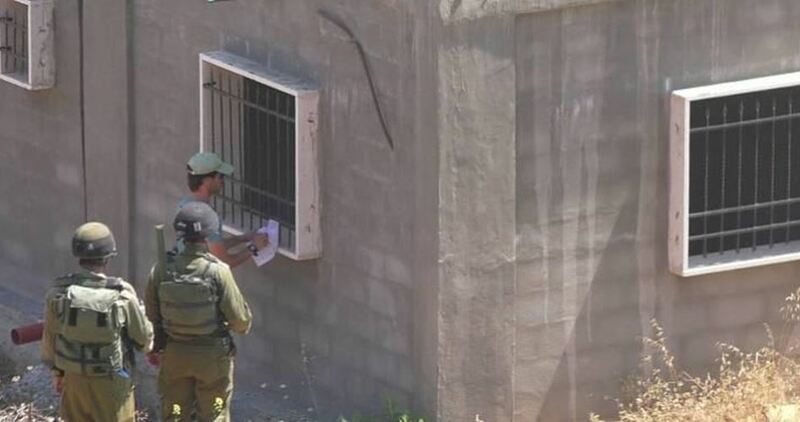 The statement said that the IOF during the same campaign confiscated a sum of money that was used by Palestinian factions for anti-Israel operations. Violent clashes broke out at dawn in Jenin city during an IOF campaign to arrest a "wanted" Palestinian. 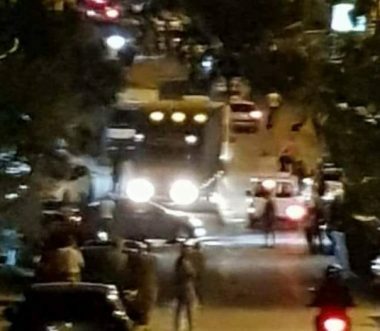 Eyewitnesses told Quds Press that the IOF soldiers surrounded the house of the Palestinian citizen Raed Abu Sorour in the eastern neighborhood of Jenin, adding that armed clashes flared up before Abu Sorour managed to withdraw from the area. According to medical sources, five Palestinians suffered different injuries during Jenin clashes. Other confrontations and arrests were witnessed in many areas in Occupied Jerusalem Sunday night. The Israeli police assaulted a crowd of Palestinian citizens in Bab al-Amud area in an attempt to force them out of the place. As the citizens refused to obey the police orders, the latter responded by heavily firing sound bombs ignoring the presence of women, children and old people. Bab al-Amud area was later emptied of Palestinians and blocked with iron barriers. Local sources reported that a Palestinian young man was arrested during the confrontations. The Hebrew website "0404" said that two Israelis, a policeman and a settler, were wounded Sunday night after being thrown with stones by Palestinian youths. 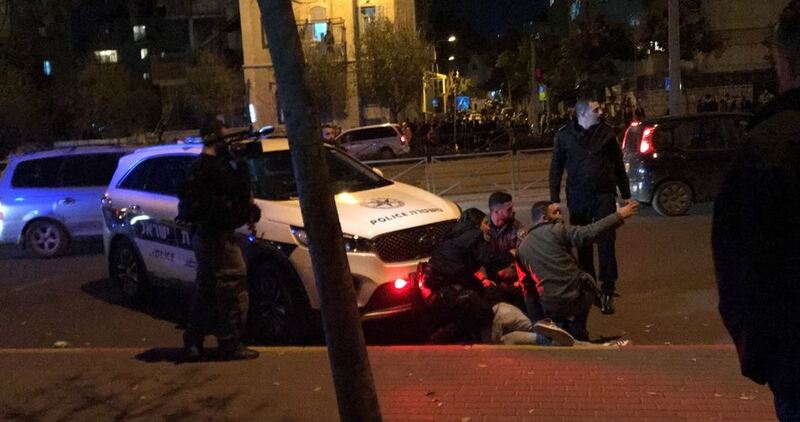 Hebrew media sources revealed that a Palestinian working at Dan Panorama hotel in Jerusalem was arrested after attempting to steal the gun of an Israeli security guard Sunday evening. The website "0404" reported that the Palestinian worker was taken for interrogation and accused of planning an attack. Violent confrontations between Palestinian youths and the Israeli police were reported in al-Tour and al-Ram towns , east and north of Jerusalem respectively. The Israeli police heavily fired sound bombs and teargas canisters at the youths who responded by throwing stones. Meanwhile, a group of Palestinian youths attacked an Israeli settlement near Jabal al-Mukabber town, south of Jerusalem, with fireworks. Local residents said that the Israeli police following the attack raided different neighborhoods of the town, arrested two Palestinian youths and took them for interrogation. Israeli soldiers injured, on Monday at dawn, five young men, after the soldiers invaded the Eastern Neighborhood of the northern West Bank city of Jenin, and fired at many Palestinians who protested the invasion. Medical sources said the soldiers shot a young man with a rubber-coated steel bullet in the neck, and another in his leg, in addition to a third Palestinian who was shot in the abdomen. They added that the soldiers also chased a fourth Palestinian, and shot him with a live round in his leg. Another Palestinian suffered various cuts and bruises while running away from soldiers who were chasing him. In addition, the soldiers invaded the home of former political prisoner, Ra’ed Abu Srour, and violently searched the property before illegally confiscating 60.000 Shekels. 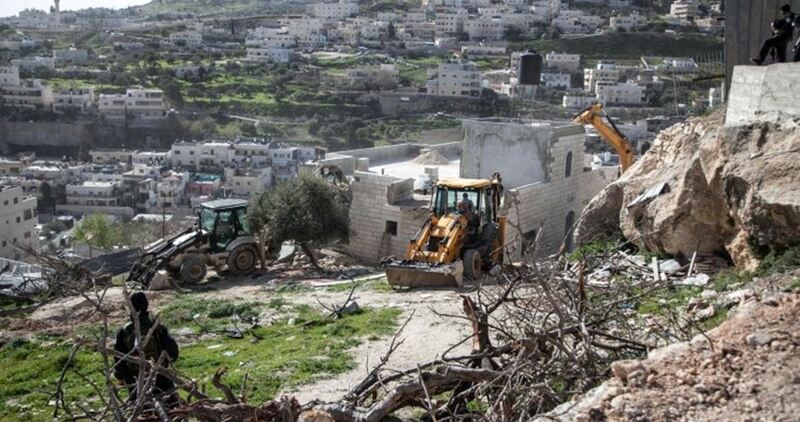 Overview – In April, a total of 44 Palestinian-owned structures were demolished or seized by the Israeli authorities in the West Bank, an increase compared to the monthly average during the first quarter of 2018 (33 structures) and during 2017 (35 structures). However, given that the majority of the targeted structures were non-residential or not inhabited, the number of people displaced during April (13) significantly declined, while the number of people who had their livelihoods and access services affected (584), increased compared to the first quarter of 2018. In Area C, the number of structures demolished or seized in April increased by nearly 40 per cent compared to the monthly average in the first three months of 2018. A total of 13 communities have been affected, with 32 of the structures targeted on grounds of lack of permit and three in the context of road building. 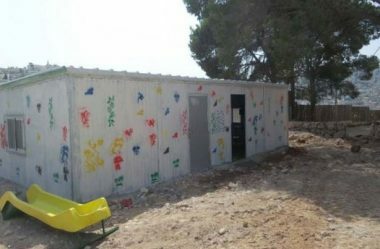 In one of the incidents, on 9 April, the Israeli authorities dismantled and seized a school consisting of four classrooms in Khirbet Zanouta village, in the Hebron governorate. The school furniture, as well as two mobile latrines and three water tanks were also seized. Four tents that were erected in the aftermath of the incident to temporarily replace the classrooms were demolished on 15 April. The school was run by the Palestinian Authority and served 24 girls and boys from kindergarten to the 6th grade. In past years, the Israeli authorities had pursued the demolition of the entire village citing the need to preserve a nearby archaeological site. 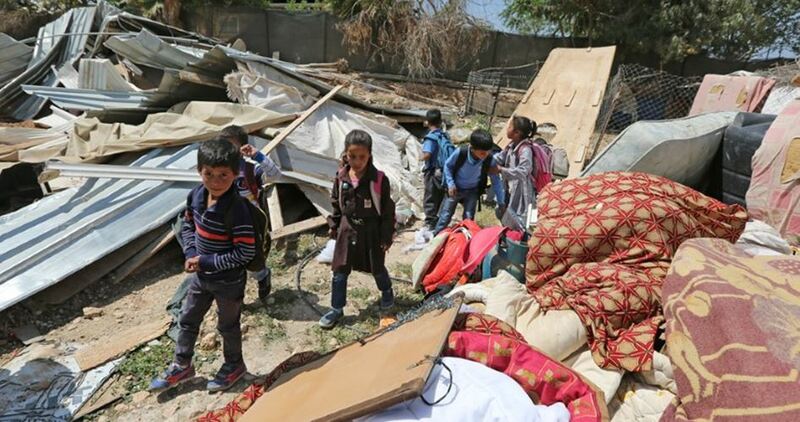 Also this month, in the Palestinian Bedouin community of Jabal al Baba, in the Jerusalem governorate, the residents were forced to dismantle a caravan, following a seizure warning given by the Israeli authorities. The caravan was installed a few weeks earlier with donor funding, and served partly as a kindergarten and partly as a women’s center and (once a week) as a clinic. On 25 April, the Israeli High Court of Justice (HCJ) held a hearing regarding the fate of another Bedouin community in the same area, Khan al Ahmar Abu al Helu. During the session, the authorities restated their intention to relocate the entire community to a nearby site (Al Jabal west), while the Court suggested that it will not rule against such relocation, despite the objection of the residents; a final ruling is expected in the near future. The community includes a primary school also serving the residents of four nearby Bedouin communities. There are at least 45 schools in the West Bank (37 in Area C and 8 in East Jerusalem) at risk of partial/total demolition. Both Bedouin communities, along with 16 others, are located within or next to a strategic area planned for the expansion of the Ma’ale Adumim settlement (the E1 plan). Without the genuine and informed consent of the residents, which is nearly impossible to obtain in the present coercive environment, their relocation may amount to forcible transfer, a grave breach of the Fourth Geneva Convention. Contrary to Area C, demolitions in East Jerusalem during April (3 structures) declined by 83 per cent compared to the monthly average in the first three months of 2018 (18), and did not include any inhabited home. This is the lowest such figure recorded in East Jerusalem since June 2017. One of the targeted structures was a donor-funded playground serving 80 children in Kufr ‘Aqab, one of the municipal areas separated from the rest of the city by the Barrier; such areas have been nearly abandoned by the municipality and suffer from serious gaps in the provision of services. So far in 2018, 15 donated structures for over 25,700 euro have been demolished/seized, constituting around 20 per cent of those demolished/seized in the equivalent period of 2017. Another two structures were demolished this month in two Palestinian localities in Areas A and B, one on punitive grounds, targeting the family home of the perpetrator of an attack during which an Israeli settler was killed in January, and the other during a search operation. The Israeli occupation forces (IOF) on Wednesday wreaked havoc on a grape field in Halhul town, north of al-Khalil in the West Bank. 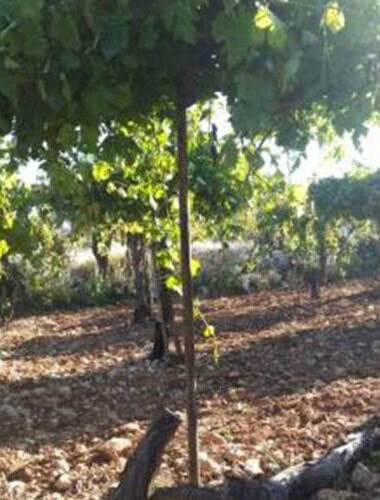 A local official said that Israeli soldiers stormed the field and cut off about 500 grape trees near the bypass in Wadi Qabbun area, east of Qalqilya. He added that the soldiers used saws to remove the trees, which belonged to local farmers from the family of Jahshan. A group of extremist illegal Israeli colonizers, living on Palestinian lands in the southern West Bank governorate of Hebron, occupied on Wednesday evening an archeological Palestinian home in Doura city, south of Hebron. 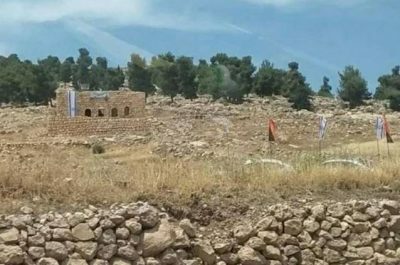 Media sources in Hebron said the colonizers invaded Ein ad-Dalba area, near the eastern entrance of Doura, and occupied the archeological home, owned by al-Harbiyyat family, and raised Israeli flags on the property and around it. Israeli soldiers were deployed in the area, and did not attempt to remove or stop the invaders, but instead prevented the Palestinians from entering the area. The head of “Kan’aan’s Sons Society for Heritage Conservation” Yousef Nassar, said there are many ancient and archeological homes extending on the main road between Hebron city and its southern areas, and are all a constant target by the illegal Israeli colonialist settlers. He added that the family has the official deeds proving ownership of the property, dating backing to the Ottoman era.